In this new collection, ZOAJE is taking its designs to the next level. We are now offering a different kind of earrings - jacket earrings. This is the story of the China studs. Camille – the designer – has been living in China for quite a while now. She traveled around this fascinating country, exploring its hidden gems and looking for inspiration. From rice terraces to mountains or megalopolis, she loves to get lost in those breathtaking landscapes. After falling in love with the country and launching her brand in China, she opened earlier this year a showroom « Studio 303 » in the heart of Shanghai, inside an old house in the middle of the former French concession. She then decided that her collection needed a CHINA set but not any kind of set. One that could tell a story about China but also inspired by European trends. This is how the China studs were created. Following an Art Deco style, their folded geometric shape reminds of the traditional Chinese hand fan. Designed in 14kgold-filled, those studs are not scared of Summer. Nothing better than wearing these shiny studs in the pool! The China studs are no ordinary studs; they are jacket earrings! What are jacket earrings? They are studs divided into two pieces, one for the front and one for the back of the earlobe. 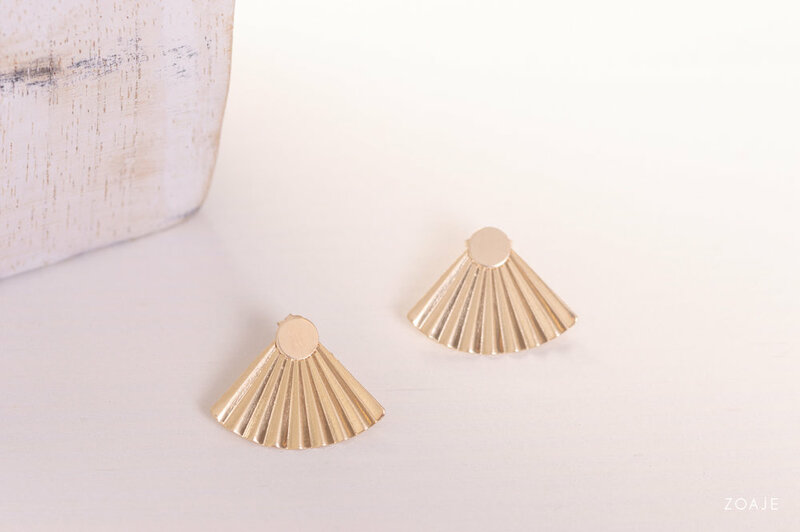 The beauty of jacket earrings is to be able to mix and match the back part with other studs! Let's play with those earrings! Since the launch of the new collection last Friday, this piece seems to become a best-seller already! It’s a must-have for this summer, grab it and adopt the trend!